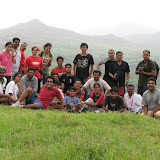 Satara is a place of plains showered with small hills all around. At times these hills are in a queue, gives an impression of being placed manually. Vairatgad Fort (Wai T; 17° 50′ N, 73° 50′ E; RS. Wathar, 21 m;) in Wai 3,939 feet above sea level, lies nine miles north-east of Medha and six miles south-east of Wai. The base village is Vyajvadi. 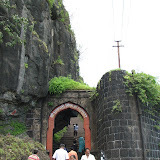 Nandgiri or Kalyangad Fort (Koreganv T; 18° N, 74° E; RS, Satara Road, 2 m. w;) 3,537 feet above sea level. Nandgiri aka Kalyangad, The hill with a big peepal tree in the dead center at the very top. 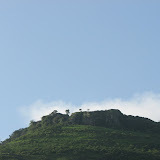 Its so prominent that Nandgiri and its tree can be spotted from other hills in Satara. It is separated from the rest of the spur by a small gorge or Khind and stands on a lower hill than the Candan Vandan range close to its north-west. mmediately after entering the lower gate a steep footpath descends within the western was into a hollow at the bottom of the scarp. The hollow is about forty or fifty feet deep. When the bottom is reached the entrance to a huge cavern is seen which can only be reached by stooping. The cavern is full of water but very dark. Outside the gate and to the north there evidently were huge caverns but these have been built up with rough masonry. Patesvar (Satara T; RS. 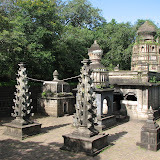 Rahimatpur, 9 m, E) a peaked hill rising above the rest of the range about seven miles south-east of Satara, has on its north-west face close to the junction of the villages of Deganv, Nigdi and Bharatganv and within the limits of Deganv a series of cave temples. From Deganv a path strikes to the south-east and winds up to a khind or gorge from which by steps in places it proceeds at a very gentle incline for about three quarters of a mile along the hill side till the temples are reached. Parali or Sajjangad [The name Sajjangad that is the fort of good men or sajjan is locally said to be derived from the number of good men who visited it after it became the residence of Ramdas Svami] Fort (Satara T; 17° 35′ N, 73° 00′ E; RS Satara Road 16 m. NE; p. 1,196) about 1045 feet above the plain and 1824 yards in circumference. The only entrance to the fort is by two gateways at the southwest angle. Both the gateways are in good order strongly built of cut-stone and flanked by towards and a parapet along the rock. The lower gateway which is partly under the rock is completely hidden from the approach and commanded by the upper gateway.